Be the first to share your favorite memory, photo or story of Iva . This memorial page is dedicated for family, friends and future generations to celebrate the life of their loved one. 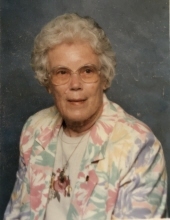 Iva Pearl Taylor Durst, 88, of Leesville, passed away Thursday, March 21, 2019. Funeral services will be held at 3:00 PM Sunday, March 24, at First Baptist Church of Batesburg with interment in Batesburg Cemetery with Rev. Henry Stamper officiating. Visitation will be held one hour before the service. Mrs. Durst was born in Leesville, SC, daughter of Eddie M. and Nettie Bell Taylor. She was married to the late Thomas Edward Durst. Mrs. Durst was a member of First Baptist Church of Batesburg. Surviving are her sons, Randall, Dexter, Wendell Durst; daughter and son-in-law, Sandra (Jeff) Langford; and two grandchildren. In lieu of flowers, memorials may be made to First Baptist Church of Batesburg, 436 West Church Street, Batesburg, SC 29006. The family would like to give a special thanks to Heartstrings Hospice and Monica for all their love and care. To send flowers or a remembrance gift to the family of Iva Pearl Taylor Durst, please visit our Tribute Store. "Email Address" would like to share the life celebration of Iva Pearl Taylor Durst. Click on the "link" to go to share a favorite memory or leave a condolence message for the family.